In light of the new administration flirting with the idea of repealing the Affordable Care Act, I wanted to share a journey from my past in the hope of offering some perspective as someone who almost lost his life as a result of medical bureaucracy and consequential loss of insurance. First, a little background. I was diagnosed with X-linked agammaglobulinemia (XLA) at the age of 3 and began monthly IVIG treatment. When I was 18 I moved out of my parents’ house because I was miserable and we had moved away from my friends and my girlfriend at the time. My mother, who for a long period of time was also my nurse while we were doing home infusions of IVIG, helped me get set up with insurance through MediCal. This enabled me to continue my monthly IVIG while not having to live with my parents. I returned to Children’s Hospital Los Angeles, where soon after I began participating in a research study for Baxter, testing out a new formula for IVIG. The result of this was that my IVIG, which is normally incredibly expensive without insurance, was free for the duration of the research study, so MediCal was really only paying for my time with my immunologist and use of the hospital facilities. Things were going wonderfully on the study. This new formula caused significantly less side effects than my prior medication, and I felt like I was finally able to give back in a way. I then made the grave mistake of turning 21 years old in 2004. I received a letter from MediCal that basically said, “You are an adult now and are no longer our problem. Best of luck to you. Your policy is being terminated effective immediately.” This was confusing and devastating to me, to say the least. I tried to appeal but was not successful. It made me feel like a ghost – like I didn’t matter at all or even exist. Children’s Hospital, however, was wonderful enough to allow me to continue my treatment as part of the research study. This continued for several months after my birthday until I was turned away by my immunologist, unless I could afford to pay cash for my visits every month, which of course, I could not. This is a decision I will never understand or agree with, and I have moved on and hold no grudges, but that is a whole other story for another day (perhaps). In this moment, fear and uncertainty became very real and tangible to me. As time went by, I started to become run down, as I always do when I am “down cycle” (the days or week prior to my next infusion). This led to my normal sinus infection, which continued to slowly get worse. Meanwhile, I was trying to figure out what I could do. I was applying for jobs that offered insurance, continuing to try to appeal to MediCal, and seeking other options such as Disability Insurance. I was finally able to get an appointment with a doctor at the Disability Office. I brought in my mountain of medical records, my continually worsening sinus infection, which had now spread to my chest, and tales of woe. This doctor refused to look at my medical records and asked me to give him “the short version” of my medical history. He then abruptly cut me off and began to examine me. He was looking for rheumatoid arthritis (RA) symptoms – some symptoms of XLA often play out as RA. My joints often get stiff and swollen. This is what this doctor was willing to see me for. Of course, my joints were acting fine during this exam, so this doctor literally called me a liar and asked me to leave his office. As soon as I got to my friend’s car, I fell on the ground in a puddle of my own tears and proceeded to have a panic attack. This was my last hope, and it had just blown up in my face. I felt like absolute garbage, both physically and emotionally. Nine months into my lack of IVIG treatment, my sinus infection had developed into full-blown pneumonia. This was the second time I had pneumonia, and it was by far the worst case I’ve experienced. I did a lot of self-medicating to try to be as comfortable as possible and had truly begun to accept the fact that I was slowly dying. One night, I woke up on my couch in the middle of a panic attack. I crawled to my bathroom, ripped my clothes off and watched my face turn blue in the mirror as I could not breathe from the combination of the pneumonia and panic. I woke up on my bathroom floor the next morning. A dear friend of mine walked me into the emergency room at the hospital he worked at, and I was admitted and treated for pneumonia. I told them I had no money or insurance. By now, I had been let go from my part-time job due to being too sick. The hospital assured me they would submit a charity write-off for me. This never happened, and the resulting bills ended up going to collections a year or so later and was a massive headache to clear up. I also had to max out my credit card to fill the prescription of antibiotics I was given at the ER. Although I didn’t die from the pneumonia, despite coming extremely close, I was not exactly healthy after this either. Eventually I ended up moving back in with my father in the mid-west in early 2005 where I stayed until 2008. I was able to go to the local clinic and have a constant supply of heavy antibiotics and steroids to keep me breathing and mostly functioning, but I was constantly sick and in the depths of a depression. I felt more hopeless than I had ever felt before. There is permanent scarring on my lungs and I no longer have the vocal range I did before all of this. After a while I started going to school again to try and distract myself and feel a sense of purpose. Every doctor I saw was the same story – “Why aren’t you on IVIG? You know, you really need to be.” My response was always the same, “I am painfully aware of this, but I can’t afford it.” This went on for five years. Everything changed when I was in Los Angeles visiting with some friends in 2006. I met a girl named Kelly through a dear friend during this visit. As sappy as it sounds, I fell in love with her the moment I saw her. We began talking on MySpace and over the telephone. She eventually came to visit me at my father’s house, and then we started dating. She gave my hope and purpose. We were long distance until I finished my Associate’s Degree, at which point I returned to Los Angeles to live with her. We got married in October 2008, and starting January 2009 I was covered under her insurance policy through the California State University System and was finally able to resume my monthly IVIG treatment. I continued to get stronger and better, and am now as healthy as I can be for someone with XLA and all that time without treatment. Now, I have a good job through California State University and am actually carrying the insurance for both of us now. It feels great to be able to give back to her for literally saving my life. I continue to sit in my cushy office as I write this story out. I am safe here. I will always be able to get my IVIG as long as I work here, and I am grateful. But that is not enough. I know there are countless other people out there with all kinds of other rare diseases who only have access to treatment through the Affordable Care Act. I will never endure another huge lapse in insurance or treatment like that again. I simply don’t have it in me, and I refuse to sit by and watch this happen to anyone else if I can do or say anything about it. I am truly hoping this new administration does the right thing and seeks to improve and build upon what the ACA has started and continue to move forward, instead of taking steps back that will inevitably cause long-term damage and even death to those with pre-existing conditions and rare diseases that rely on programs like the ACA. I have no idea how or why I survived that period of my life, but I also believe everything happens for a reason. I grew a lot during that time and learned a lot about my body and my resolve. I believe I am here now to share my story, advocate for those who can’t advocate for themselves. Thank you for your time. I love you. 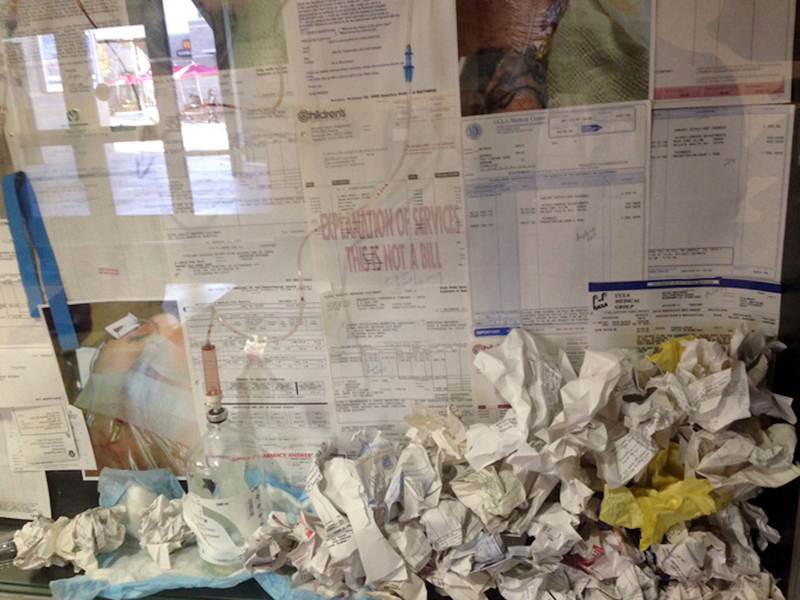 The photo above is a detail shot of a public art installation I did a few years ago titled “Relics,” to bring awareness to health insurance issues as it related to pre-existing conditions and rare diseases. If you would like to see more of my work, you can visit www.davidlucienart.net.